Published: May 19, 2010 at 07:26 p.m. The bright lights of the Big Apple have cast an intense spotlight on the latest version of the Jets defense in New York. By contrast, it has left the defense of the New York Giants in the shadows. Start with the bodacious proclamations of Rex Ryan, then add the star-studded additions to his top-ranked Jets defense, and it has rendered the Giants as back page fodder after their woeful performance in 2009. However, the presence of a new defensive coordinator is not only enough to make the Giants defense relevant again, it could spark them on another run to the world title. That catalyst is Perry Fewell, who served as the Buffalo Bills' defensive coordinator for the past four seasons and replaces Bill Sheridan as the architect of the Giants' defense. Fewell brings a respected reputation for producing hard-hitting units with a knack for producing turnovers. Under his direction, the Bills ranked second in the league with 28 interceptions last season, and fielded the second-best pass defense. The unit surrendered only 14 passing touchdowns, which tied as the second-lowest total in the league. In New York, Fewell inherits a defense that underachieved mightily in 2009. 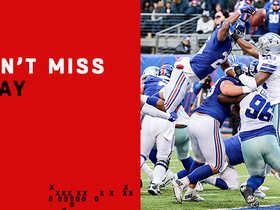 The Giants allowed 26.7 points per game, and surrendered the second-most passing touchdowns (31) in the league. Given that ineptitude against the pass, the onus now falls on Fewell's shoulders to quickly rebuild a unit that must slow down the explosive offenses of the Dallas Cowboys, Philadelphia Eagles and Washington Redskins within the division. The Cowboys and Eagles, in particular, offer unique challenges because they both finished within the top 11 in total offense (Cowboys ranked second; the Eagles 11th) last season, and both averaged over 22.0 points per game. While the Redskins' offense didn't fare as well, the additions of Mike Shanahan and Donovan McNabb ensure that the unit will pack more punch than last year's version. Fewell must bring his defense up to speed to keep the Giants competitive in a division that should rank as one of the league's toughest this year. In starting his reclamation project, he should initially go to work on the team's woebegone secondary. The Giants were frequently victimized by the big play last season, and the spotty coverage in the back end was to blame. Though injuries to Aaron Ross and Kenny Phillips contributed to the performance, blown assignments and mental mistakes resulted in receivers running free through zones. The presence of so many backups in the secondary also left the team at a significant disadvantage when facing offenses with multiple playmakers in the passing game. Unable to match up effectively in man-to-man, the Giants were forced to sit back in conservative zone coverage, which allowed accurate throwers to pick them apart with an assortment of short- and intermediate throws. 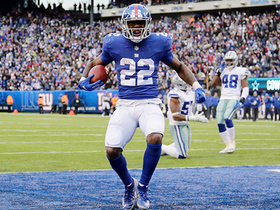 However, the return of Ross and Phillips will bring back some star power to the lineup, and the addition of free agent Antrel Rolle gives the team a ball-hawking presence at free safety. The sixth-year pro has 12 career interceptions, and is coming off a season where he recorded four while roaming the middle of the field for the Arizona Cardinals. His ability to produce takeaways will significantly upgrade a defense that finished the season with only 13 interceptions. 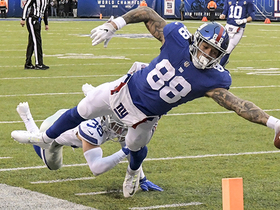 Although the Giants' upgraded secondary will undoubtedly play the biggest role in the team's defensive improvement, the duty also falls on the shoulders of the team's ballyhooed defensive line to truly spark the revival in New York. Justin Tuck, Osi Umenyiora and Mathias Kiwanuka need to rediscover their disruptive ways for the Giants to return to the ranks of the elite. Last season, the trio combined for only 16 sacks (the Giants ranked 18th overall with only 32 sacks), and the lack of a consistent rush exposed the vulnerable secondary. 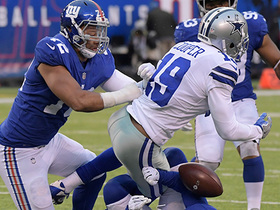 The shortcomings forced the Giants to blitz frequently, which resulted in more big-play opportunities for their opponents. The Giants allowed 51 completions over 20 yards, and an additional 10 passing plays that covered 40 yards or more. Given the damaging effect that "explosive" plays have on a defense, the Giants must quickly buy into the tenets of Fewell's scheme, which emphasizes keeping balls in front of the defense and creating turnovers off tips and overthrows. The pass rush is paramount to the success of the defense, and the Giants have enough weaponry along their front line to create pressure with four rushers. First-round pick Jason Pierre-Paul joins Tuck, Umenyiora and Kiwanuka in the rotation, adding another explosive pass rusher to use off the edge. Throw in a healthy Chris Canty and Rocky Benard on the inside, and the team has the depth to attack their opponents in waves. That kind of depth was key to the Giants' title run a few seasons ago. It will remain a pivotal part of their game plan this fall. Although questions persist about the middle linebacker position, the ever-important role as the defensive signal caller may fall on the shoulders of rookie Phillip Dillard. The fourth-round pick out of Nebraska is set to compete for the job with veterans Jonathan Goff and Gerris Wilkinson, who would appear to have the inside track on the job due to their size. But Dillard's athleticism and toughness are ideal fits in Fewell's scheme, and he should emerge as the team's starter on opening day with a strong performance in training camp. Tom Coughlin is intent on remaking the Giants' defense into the hard-nosed, physical unit that has been a hallmark of the franchise for years. Enter the energetic Fewell. With a talented cast of playmakers, he's set to lead the re-emerging Giants defense this fall.